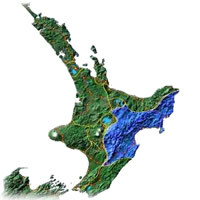 Hawkes Bay is known in New Zealand and abroad for its award winning wines and vineyards. Napier, one of its main towns, has been rebuilt in a Art Deco architecture after the famous earthquake of 1930. The sub-tropical mediterranean type climate of the Hawkes Bay makes it ideal for a range of outdoor activities or just for enjoying the beautiful beaches of the region. The region is home to quality primary produces, orchard and olive groves, vineyards, and sea foods. The Hawkes Bay also boasts the world's largest mainland gannet colony. Visit the C J Pask vineyard in Hastings. Cape Kidnappers is the largest and most accessible main land Gannet Colony in the world. Gannet Safaris will drive you in 4x4 air condition vehicles to within metres of the amazing birds. Travel over Cape Kidnappers Station a 5,000 acre sheep and cattle station, with spectacular coastal & inland views. Traveling through gullies & over riverbeds lined with native flora and fauna.